NIA CHARLESTOWN NEVIS (October 31, 2017) — Mrs. Garcia Hendrickson, patron of the first Miss Nevis Senior Pageant, thanked the Nevis Island Administration (NIA) for affording her the opportunity to work with the island’s seniors. She described her tenure as a very challenging one but an exciting and unforgettable experience. Her brief remarks were in response to the public acknowledgement of her tenure, during the pageant at the Nevis Cultural Complex, on October 28, 2017. Hon. 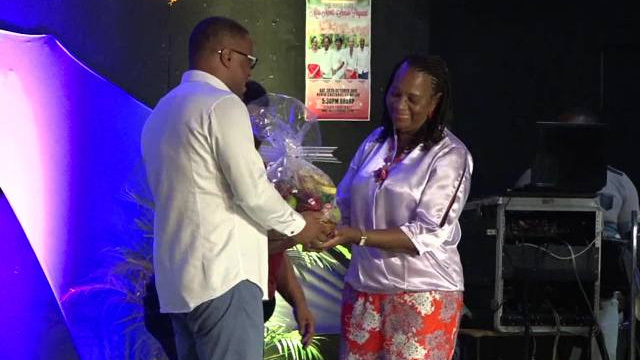 Mark Brantley, Deputy Premier of Nevis and Minister of Social Development presented her with a fruit basket on behalf of the Department of Social Services, Senior’s Division as a token of their appreciation. Mrs. Hendrickson also used the opportunity to thank all the workers in particular those who made her tenure a memorable one and to all who donated to the Division. During the presentation, the Minister thanked Mrs. Hendrickson for her dedication to the seniors. 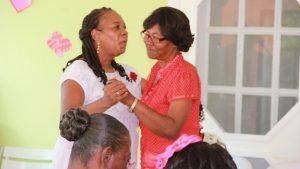 “On behalf of all of us in Nevis, the seniors and those like me who are almost seniors, we want to thank you for all your hard work and thank you for your dedication to the seniors of Nevis. “We feel that you have revolutionised what we have done here and we thank you for that and I am sure we will have another opportunity to thank you in a different place and on a different occasion but for tonight, we acknowledge you publicly and hope that you enjoy this fruit basket,” he said.